If the “New Woman” was an idea in the ‘20s . She was now a force to be reckoned with in the ‘30’s. Assertive, fearless, and articulate, she could hold her own in a man’s world. Her profession? Reporter or lawyer: “The Front Page” (1931), “Smart Blonde” (1937), “Torchy goes to War” (1938) or “His Gal Friday” (1940). In Europe several American women reporters fit this description perfectly. 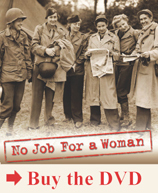 Taking advantage of the still uncodified war reporting profession and the social climate post-suffrage that allowed for smart independent women, Margaret Bourke-White, Virginia Cowles, Frances Davis, Martha Gellhorn, Josephine Herbst, Helen Kirkpatrick, Sigrid Schultz, Dorothy Thompson, Betty Wason and others were there to witness and record brewing events.